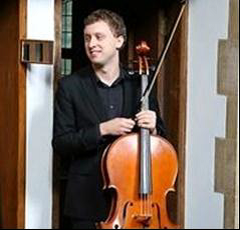 Matthew Strover, 23, began learning the cello at an early age at Havering Music School and then at the Coopers’ Company and Coborn School, progressing to the Junior Royal Academy of Music at 15. While at JRAM he was a member of the Symphony Orchestra under Peter Stark. As a junior cellist, Matthew had much success in local competitions, winning many prizes as well as the titles of Havering Young Musician of the Year (2008) and Romford Rotary Young Musician of the Year (2007). An experienced orchestral player, Matthew has appeared as principal cellist of various orchestras, including the University of London, Trinity Laban and Ernest Read orchestras. Recently he has performed in the Royal College of Music Symphony Orchestra under John Wilson and Sir Roger Norrington. He has enjoyed performing in many prestigious London venues such as the Wigmore Hall, St Martin-in-the-Fields and the Southbank Centre, and has toured Europe with orchestras on a number of occasions.